Book this cutie and treat yourself to a wonderful week cruising around the islands in Central Adriatic. 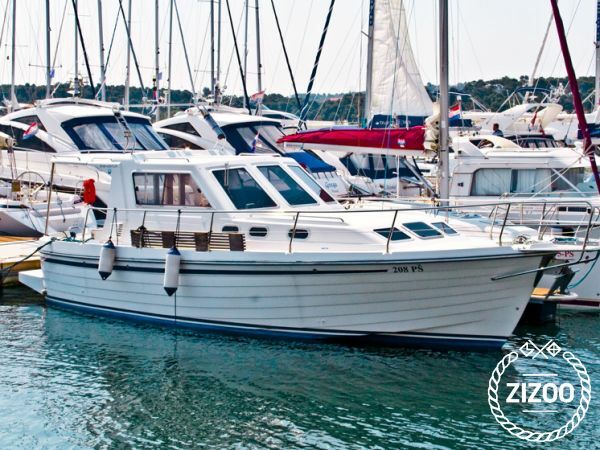 Mandalina is a 2005 Adria 1002, fishing enthusiasts will just love her. Swimming platform at the stern provides easy sea access, and her bow is perfect for diving - so have that camera ready to capture your crew being silly! There's also snorkelling equipment onboard, so you can explore the underwater world. She will take up to 8 of you, in her 3 double cabins and the saloon, but you will probably spend most of your time in the cockpit, and for that purpose she comes with a table and cushions to make your stay super comfortable. Pick her up in Sibenik, and before you head out make sure you take a stroll around stone paved streets of this gorgeous town! Krka River is a national park just around the corner, we recommend going up the channel to check it out, maybe even go for a swim at the waterfalls. Now that you've seen all that, Kornati Archipelago is waiting, so get going! 1A Törn hatten wir mit einem super charmanten Skipper. Mit dem Lagoon war alles top in Schuss. Gerne wieder!